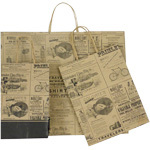 Use our patterned paper shopping bags to create a stylized look to your retail store. Choose our exclusive Newsprint design to create an old fashioned vibe, or choose our Zebra Turquoise design to create a new age feel in your retail store. Patterned Paper shopping bags also work great for gift giving. Vanity-Missy Size 10" x 5" x 13"